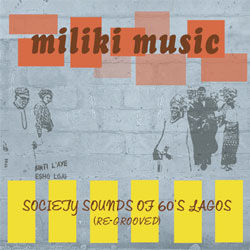 "Society Sounds of 60's Lagos (re-grooved)"
“Miliki Music” harkens to the mood and style of King Sunny Ade’s 1980 international debut ‘Juju Music’ but without a major label production budget. It differentiates itself in a broader creative spectrum from its seven distinctive featured artists and a modernist take on tradition. Its two octogenarians, veterans of the 60s,highlife, Fatai Rolling Dollars and Kokoro, and the guitarist scion of the founding father of Yoruba Juju guitar music, Biodun Ayinde Bakare, lend this collection a cache similar to the Buena Vista Social Club phenomenon. King Sunny Ade’s ‘Juju Music’ album was the seminal ‘afro-pop’ release that broke into the American mainstream market in 1980. The tone of that unfamiliar yet enchanting, urban downtempo music suggested a spiritual yet bacchanalian grace in its undulating vocal harmonies and incessant groovy percussions, not to forget the leader’s heady Hawaiian slide guitar lines. For a native Nigerian-Yoruba who was of age in the 60s, that quality was the prevalent aesthetic of good party music from that glorious era. The tempo was from the popular big band highlife, but the instrumentation was of ‘Palm Wine Guitar’ music sexed up for conspicuous body gyrations, aided and abetted by multiple percussions and a vocal slant from Yoruba hymnals of a colonial era. Musically and stylistically this is what ‘Miliki Music’ is about. It also aims to redress the injustice of oblivion that has befallen the proponents of this 60s Yoruba highlife, particularly the two octogenarians, Fatai Rolling Dollars and Kokoro. The four main featured artists are introduced below. Fatai Rolling Dollars (Fatai Olagunjo) is an 80 yr old Guitarist. Singer and Exponent of the Native Thumb Piano (Agidigbo) who in is his 64 year career mentored some of the most successful musicians of the latter generation, the likes of Ebenezer Obey, and whose compositional styles influenced King Sunny Ade and Fela Anikulapo Kuti. Kokoro (Benjamin Aderaunmu) is an 82 year old blind minstrel singer and percussionist who started his musical career in the 40s, on the street of Lagos accompanying himself on the tambourine (samba) and the Tin drum. He is renowned as a solo performer, recognized for his inimitable raw gritty yet mellifluous voice. However his contributions here are some trio and quartet rehearsal recordings in his living-room. Duro Ikujenyo, is the veteran keyboardist for Fela Anikulapo Kuti' s Egypt 80's band from mid 70s to mid 80s. He was said to have produced some of Fela's more trenchant songs. The song ‘Unknown Soldier’ was credited to him. Biodun Ayinde Bakare is the scion of the pioneering Yorubajuju and highlife musical icon Ayinde Bakare. He is a master of Yoruba palm-wine guitar and has now taken up the baton to continue his father’s legacy. His repertoire includes some of his father’s most memorable music from the 60s. Though many of the songs here reference the 60s Juju-Highlife tradition, they are in fact more recent recordings with a much paired down instrumentations and a modern (groove enhanced) production in comparison to those recordings from the 60s. Other songs that hint of Afrobeat, Jazz and Big Band Highlife round up this amazing selection of modern Nigerian music. All recordings are from the catalogue of JazzHole records, based in Lagos, Nigeria.